Above left: GIF animation made from the 11 originals provided by this witness. Obviously, these have been cropped and enlarged. albeit, probably at a much slower rate than this of course. Witness Statement: These images have been on my computer for a long time, because I didn't know what to do with them or who to send them to; so, I found your site and wondered if you could take a look and may be let me know what the hell this object is. 26 June 2011 late afternoon; just returned from Manchester airport after photographing planes. 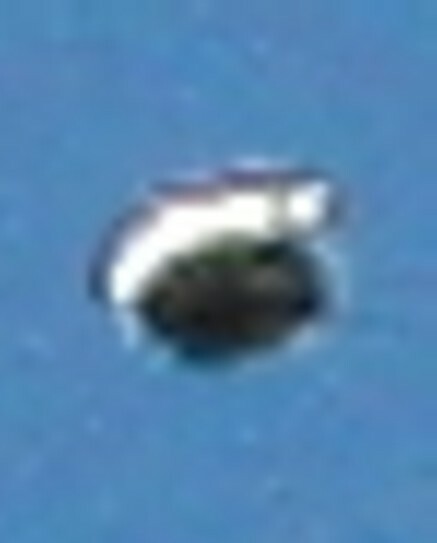 Went in to my back garden, don't know what made me look up, but from my garden looking NW, I spotted this object. I was using a Canon 100/400 lens and it was at full zoom the object was directly over the flight path from Manchester departure to the south. The planes pass over my house roughly 5000 feet or above and this object was just sat there and caught my eye so I got these shots before I lost track of it. As you can see clear sky warm and it changes shape - then it was gone!